In stock 57 items in stock. 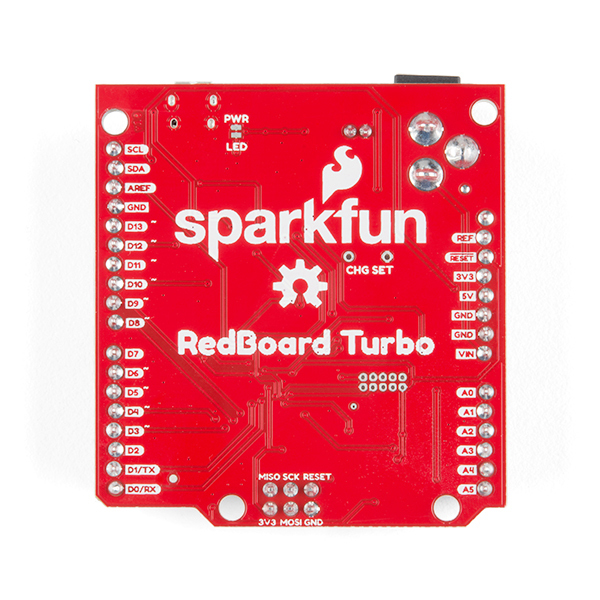 If you’re ready to step up your Arduino game from older 8-bit/16MHz microcontrollers, the SparkFun RedBoard Turbo is a formidable alternative. 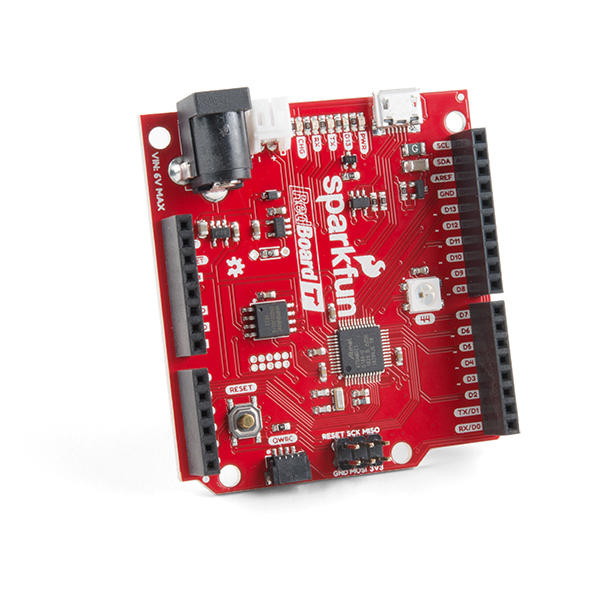 At its heart, the RedBoard Turbo uses the ATSAMD21G18, which is an ARM Cortex M0+, 32-bit microcontroller that can run at up to 48MHz. With an impressive 4MB of external flash memory and a UF2 (USB Flashing Format) bootloader, the RedBoard Turbo provides you with an economical and easy to use development platform if you're needing more power than the classic RedBoard. 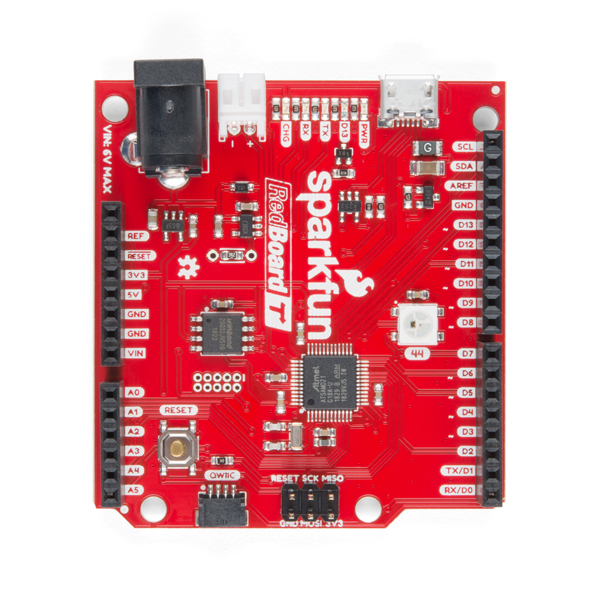 The SparkFun RedBoard Turbo has been equipped with a USB interface for programming and power, a Qwiic connector, an RTC crystal, WS2812-based addressable RGB LED, 600mA 3.3V regulator, and a variety of other components. To power the RedBoard Turbo, just plug it into a USB port on your computer via the micro-B port or directly into the wall with the 5V tolerant barrel jack. Not near a USB port? No problem, the SparkFun RedBoard Turbo is also equipped with a LiPo Battery connector (for a single-cell 3.7-4.2V litium-polymer battery). The MCP73831's charge current is configured by a resistor value between 66kΩ and 2kΩ, to charge the battery at a rate between 15mA and 500mA, respectively. By default, the board is configured to charge the battery at around 250mA. If you’ve used any Arduino before, this pinout shouldn’t surprise you – the layout meets the Arduino 1.0 footprint standard, including a separate SPI header and additional I2C header. The RedBoard Turbo can even be flashed over the Mass Storage Class (MSC) just like a removable flash drive, thanks the the UF2 bootloader. With this bootloader, the RedBoard Turbo shows up on your computer as a USB storage device without having to install drivers! From the Arduino IDE, you’ll still need to select the correct port on your machine, but you can just as easily use another programming language such as CircuitPython or MakeCode. 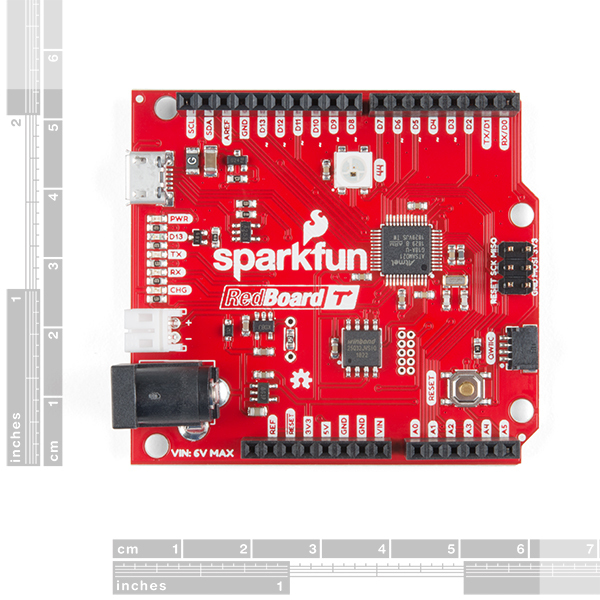 Note: The barrel jack connection on the RedBoard Turbo has a lower input voltage than most Arduino development boards. Make sure that you are using a power supply below 6V. Please be aware that the RedBoard Turbo is also a 3.3V device and not a 5V one like the original RedBoard. A simple project using the Qwiic Keypad and the RedBoard Turbo to create your own custom hotkey-pad. An introduction to the RedBoard Turbo. Level up your Arduino-skills with the powerful SAMD21 ARM Cortex M0+ processor! How to setup extra SPI, UART, and I2C serial ports on a SAMD-based boards. Nice board especially the price. I suspect a lot of folks may start to use it instead of the UNO. A word to the wise if you plug in your favorite UNO shield that is populated with an ISP header, Shields such as the proto shield DEV-1382/13819 and the microSD shield dev-12761, the 3.3volts will be shunted to the 5.0v USB supply.There are several ways around this but if you don't wish to cut board traces you can pull the 5.0v pin from the shield's ISP stackable header. As a side note the ISP header connections are not documented on the schematic for this board. This is also the case for the case for the SAMD21 Dev Breakout (DEV-13672 ). This information is available on the graphical data sheet and the eagle files. On a Mac, make sure you are using a quality USB cable, or you will have difficulty getting the USB port to show up in the Arduino IDE. At least that has been my experience. This is not unique to this board with Macs. If you are connecting this to a Pixy2, you will have to modify the Pixy2 library and replace references to the "Serial" object with "SerialUSB". I had to modify Pixy2.h, Pixy2CCC.h and TPixy2.h in this way. I also had to remove the ZumoBuzzer.cpp from the library in order to compile my sketch. I don't have a Zumo robot, so I didn't bother debugging the issue. After modifying many libraries and pulling my hair out I found a quick solution, start your sketch with "#Define Serial SerialUSB" (before all the other library calls) to map the SerialUSB to Serial - then any standard AVR arduino libraries will work with the turbo without modification. I've written code that will work on either board flavor by just commenting or uncommenting that snippet. Does the new board allow the user to turn off that insanely bright power LED? (Yes I know I can put tape over it, but it's still using power). Other than that, I love my original Redboard. There is a cuttable trace for the power LED. A 32-bit ARM Arduino-like board, with built-in battery management and bonus flash storage, for (slightly) under $25? And from a non-shady vendor like SparkFun who supports their stuff? Very, very cool. I see a debugging socket on the board (unpopulated). What is the pitch of the socket? What debugger does that require? Also, if I load my own code through the debugging socket, does that invalidate the UF2 bootloader, or can it still be used? Those pins are for SWD; they are 50 (not 15... see reply below) mil pitch. In production, we use an Atmel-ICE programmer. You can use any similar product as long as it is AVR/SAMD compatible. As with all programmers, you are flashing the microcontroller... so yes, the bootloader would get overwritten. However, the bootloader is available in the Firmware folder of the GitHub repository if you need. Thanks for the reply. One further thing -- do you use Atmel Studio for development, or something else (I'm a PIC developer used to MPLAB X; I'm not sure that covers SAMD parts)? Thanks again. Unfortunately, I don't know. The SAMD21 is an Atmel chip, so you should be able to do your own development with Atmel Studio. I thought those were 50 mil pitch? You are correct. According to the Eagle files, they are 50 mil pitch (.05"); I heard my coworker wrong. Nice Board. Arduino Library issue. Just starting to use the board. I'm working on a problem with connecting a shifting uSD breakout board. After updating an SD library example sketch for the Serial port name change, I found that the standard SD library has some Serial.print statement embedded. A couple src/utilities/~.cpp files have these Serial.print statements embedded. This could get complicated if other libraries do the same. Otherwise the board is performing as advertised. The hookup guide is quite accurate and complete and excellent for getting up and going.